This is a follow up to my post, 4 Things I Did to Get Started With Writing Fiction. I think when it comes to being the writer and artist of your own comics, the most important thing to learn is how to create stories. Pictures are an add-on option. Having good art is important, but when the story is boring, good art cannot redeem it. I’ve been drawing comics since I was eight. When I was about 19 I stopped drawing for a few years. Huge mistake! When the urge to draw a comic again hit me, I had to re-learn a lot of drawing skills and retrain my eye. But regardless of what I’ve gone through, the foundations of my comic skills came from my younger self. Here’s what my childhood/teenaged self has to teach about getting started with creating comics. These are skills that still impact me today. When I was four I read a lot of picture books. The result was that at a young age, I would write stories and illustrate them. Comics are elaborate illustrations with text incorporated. If doing a full comic is intimidating to you, try to drawing scenes from your favorite stories instead to get a feel of drawing body language and settings. Another thing I did was make illustrations of my life in my journal. I would write about what happened to me for that day, and then draw a picture of it. My pictures were horrible, but they were illustrations from my life. Drawing scenes of situations from your life, be it from your imagination or what you observe, helps you to build some must have skills for creating comics. If you want to get more into writing and drawing, I recommend that you do the writing exercises from the 4 Things I Did to Get Started With Writing Fiction post, and then draw scenes from what you write. ...And go beyond the types of comics that you are comfortable with. When I was eight, I read a lot of Archie Comics, Disney Comics, and newspaper strips. In my pre-teens I read a few superhero comics, but then I was introduced to shoujo manga--and that was my love. Reading different types of comics helped me to understand that there was more than one way to tell a story visually, and that different styles can create different feelings. Explore different styles and think about which ones resonate with you the most. Why do they resonate with you? Is it the way panels are placed on the page? The way characters are designed? Do you like the way the artist draws emotions or settings? What are you enjoying about the story? Really focus in on what you like. That’s how I learned how to copy artwork that I saw. At first copying may seem counter-intuitive, but the thing is, you can only copy for so long until you start drawing things on your own. If you’ve copied enough from a wide variety of sources, you will have a mental library of images. You will have your own visual “alphabet” of how to draw eyes and noses and backgrounds which will end up being original when you put it all together in one drawing. Do not get hung up on art materials and software. I’ve found that it’s more important that I learn how to create comics with whatever materials I have laying around first and then learn how to use software and professional tools later. I've created comics using crayons and color pencils. I made my first popular comic in the eighth grade. It was around 20 pages or so drawn into a cheap sketch book. I shared it with a friend at school, and she loved it so much that she asked if she could borrow it and show it to her friends. Then when she eventually returned my sketchbook to me, another friend of mind wanted to read it. So I loaned my sketchbook to her, and she shared it with her younger sister who read my comic over and over again. So the point of this is, I drew this comic in a sketchbook. In pencil, by the way. It was not even inked. Yet, it was enough for me to create a decent story that others seemed to enjoy. My more recent comics were drawn on regular printer paper. If you want to get more experience drawing comics with materials on hand, I highly recommend checking out the book Drawing Comic’s Lab. Draw and finish a comic. Then start another one. I’m sorry if this sounds repetitive from my fiction writing post, but the same thing applies. If you get to the character creation part of your comic, but never get any further than that over and over, you will only learn how to create characters. If you repeatedly draw just the first part of your comic, that’s all you will know how to draw. But if you learn how to draw a comic from the first panel to the last over and over, come what may, you will get good at creating finished comics. Keep the comics that you make in a binder or create a handmade book of them. Keeping a printed collection of my comics helps me to see my progress and gives me that warm and gooey satisfaction inside from seeing how many stories I’ve finished. And it’s very motivating to see your library grow over the years. 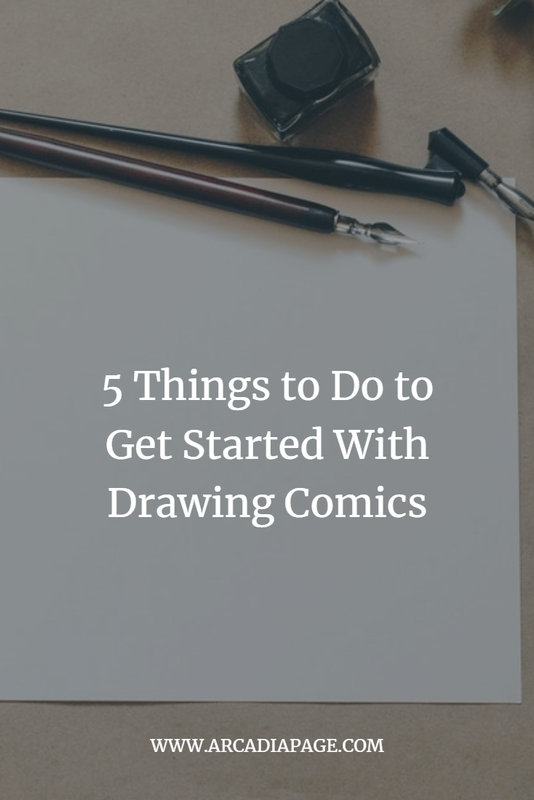 I hope this list helps you to get started with writing and drawing your own comics. Any thoughts? Question? Comments? I'd love to hear what you think!